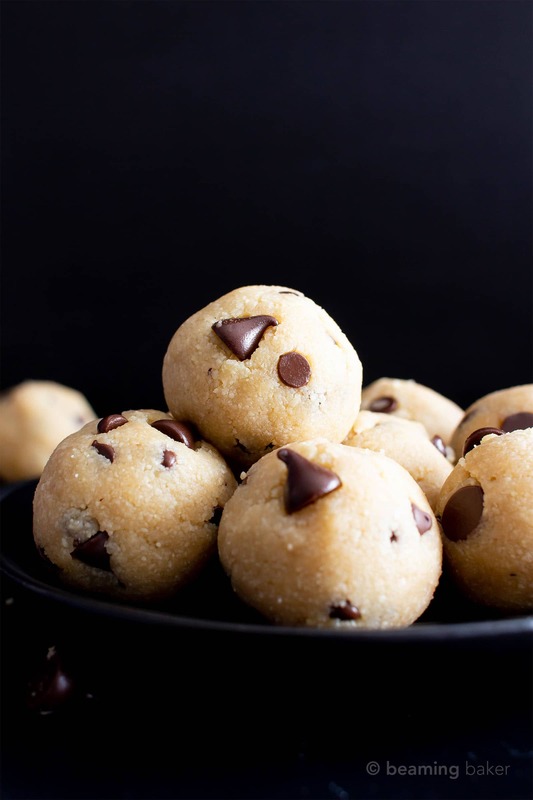 This decadent paleo edible cookie dough balls recipe is made with almond flour, just 6 healthy ingredients, easy, healthy & gluten-free! It’s the best vegan chocolate chip cookie dough bites recipe ever! Only 83 calories per bite, plus 3 grams of sugar, 2 grams of protein, and 6 carbs, GF. When I was a little kid, I absolutely LOVED picking the cookie dough balls out of cookie dough ice cream. Then, I grew up, got my own moola and realized: um: duh! You can just buy a whole roll of cookie dough and go to town on it. Except for the whole “don’t eat raw cookie dough” thing. Edible cookie dough? What a pesky little thing to worry about! 😉 So imagine my delight when I started baking vegan everything: vegan chocolate chip cookies, vegan chocolate cake, vegan paleo coconut macaroons. It suddenly dawned on me: I can pretty much eat any batter, dough, filling, whatever-I-darn-well-please, RAW!! Woohoo!! Easy! Since we’re working with vegan ingredients, everything in this recipe can be eaten raw. What does that mean? None of the ingredients for this paleo cookie dough bites recipe needs to be pre-baked. 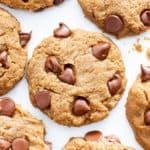 Some edible cookie dough recipes call for baking the flour for a bit because it can’t be eaten raw – that’s blessedly not the case for the flours used in this cookie dough recipe: almond flour and coconut flour. All you have to do to make these edible paleo cookie dough bites is: toss all the ingredients except the vegan chocolate chips into a bowl. Stir until thickened and very well mixed. Fold in the chips or chopped up paleo chocolate, and start scooping. Wait 5 whole minutes for them to set (or not… hehe), and enjoy. Super easy, right? 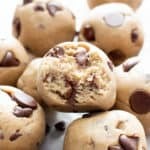 Is this Paleo Cookie Dough Bites Recipe Vegan, Gluten-Free, and Healthy? Yes, yes and yes. These paleo chocolate chip cookie dough bites are made with all vegan ingredients – from the almond flour and the coconut flour to the pure maple syrup and the vegan chocolate chips. Woohoo! 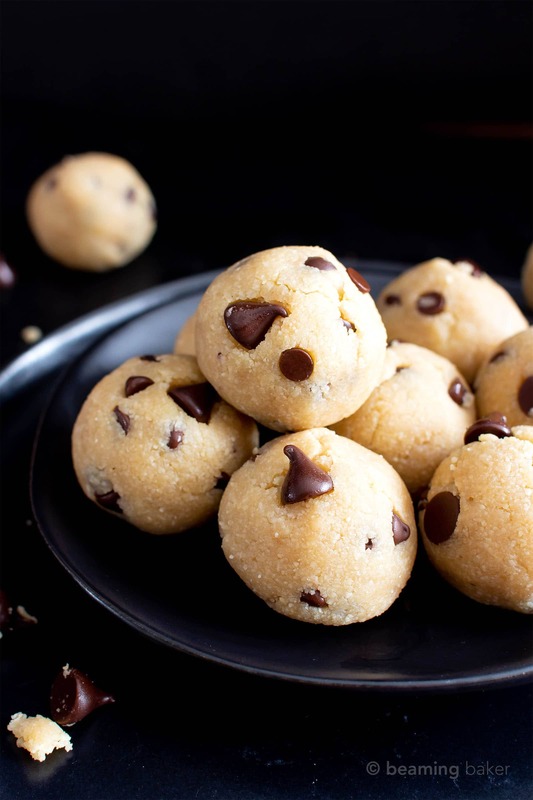 So that means: you guessed it: these paleo cookie dough balls are dairy-free, too. 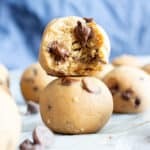 Edible Paleo Cookie Dough Bites with Almond Flour, Coconut Flour or Oat Flour? 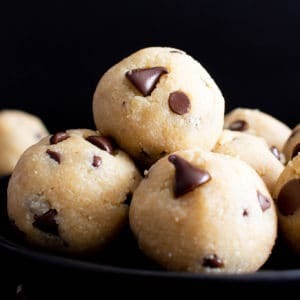 So the actual question is: Can I make these edible paleo cookie dough bites with almond flour, coconut flour, or oat flour? Answer: Yes. However, you know you’ve gotta always tread lightly when it comes to making ingredient substitutions. 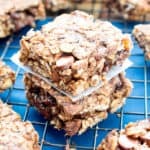 Since this recipe already includes almond flour and coconut flour, you’re set in that regard, but for more deets on other subs, read on… For an oat flour cookie dough bars recipe, try my Healthy Gluten Free Cookie Dough Bars. 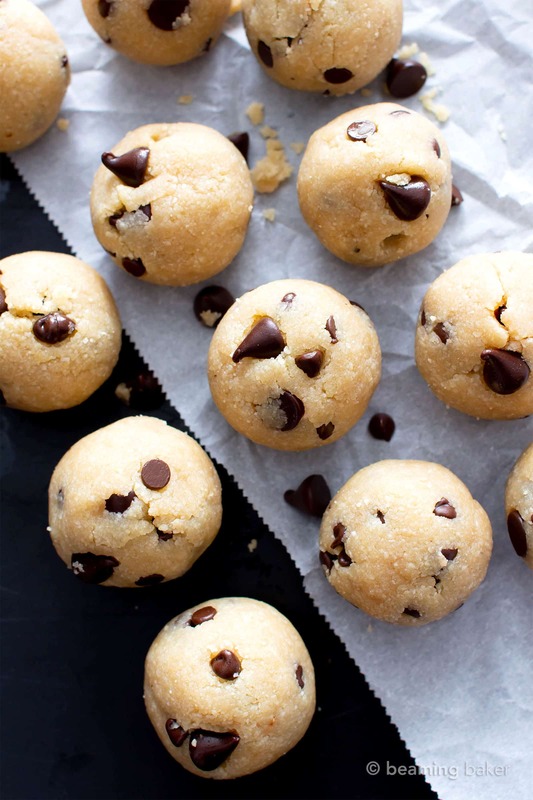 What Ingredients Can I Substitute or Swap in this Almond Flour Cookie Dough Bites Recipe? 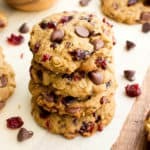 How do I swap all the flour in this existing paleo cookie dough recipe for gluten free oat flour? Quickest answer ever: make this recipe instead! 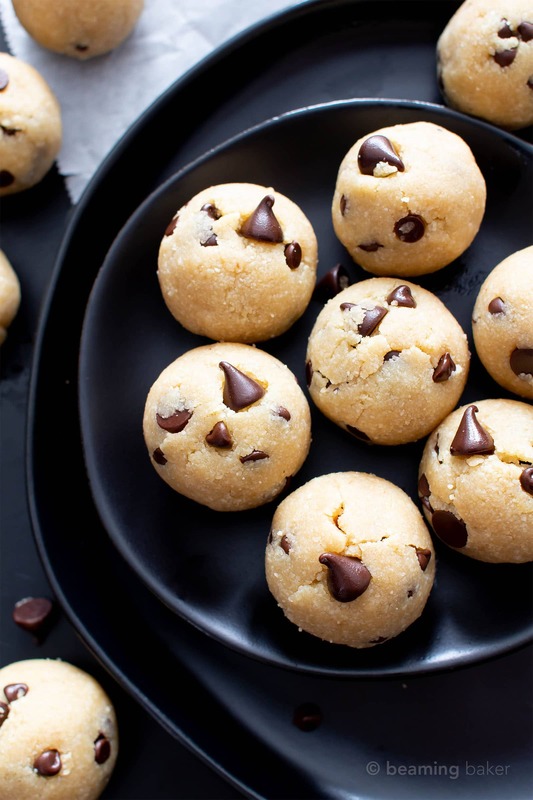 → 5 Ingredient Chocolate Chip Cookie Dough Bites Recipe. It’s a vegan & gluten free cookie dough bites recipe that I perfected with gluten free oat flour. 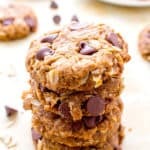 If you’re looking for baked cookies made with oat flour, try my Best Gluten Free Oatmeal Chocolate Chip Cookies Recipe. How do I swap all the flour in this recipe for coconut flour? 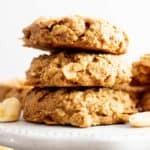 Can I use another sweetener for this paleo cookie dough recipe? Yes. A lot of readers have swapped my usual go-tos: pure maple syrup and coconut sugar for a variety of other sweeteners in my recipes. The only thing: every sweetener works differently. (Alright, who else is thinking about Ari’s latest album and wondering whether or not she might have more expertise in this? Hehe.) For example, honey is super thick—much thicker than maple syrup, so it might not add as much needed moisture to the recipe. Also, other sweeteners might not be as sweet, or much sweeter than the maple syrup I used in this recipe. So experiment as much as you’d like, but don’t have my head if your swaps yield an unexpected result. Good luck! Paleo Vegan Chocolate – simply amazing paleo chocolate. My favorite paleo chocolate to date – it’s rich, perfectly sweet and bonus: gluten-free, vegan, dairy-free and refined sugar-free. Try chopping up this paleo vegan chocolate bar in place of vegan chocolate chips. Cookie Scoop – such a kitchen essential. This scoop helps you pack the paleo cookie dough perfectly and measure out uniform amounts of cookie dough. 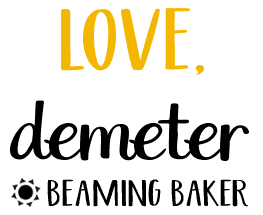 I use this in my Big Sesame Tahini Cookies (Paleo, Vegan) and more. Almond Flour – super high-quality almond flour. It’s so finely ground and seriously perfect in so many recipes! Coconut Flour – all you need is one little bag, and it’ll last you the entire year (or more). A little bit of coconut flour goes a long, long way. This brand is high-quality, very consistent, and always fresh. 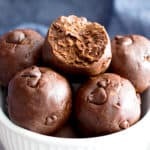 Paleo Cookie Dough Bites (V, GF): this decadent paleo edible cookie dough balls recipe is made with almond flour, just 6 healthy ingredients, easy, and gluten-free! It’s the best vegan chocolate chip cookie dough bites recipe ever! Add almond flour, coconut flour, maple syrup, oil and vanilla to a medium bowl. Using a spoon, stir until thickened and well-incorporated. If needed, use a rubber spatula to fold together into a cohesive dough. Fold in chocolate chips or chopped paleo chocolate. Using a cookie scoop, scoop and drop balls of dough onto the prepared baking sheet. Here is the 1-tablespoon cookie scoop and 2-tablespoon cookie scoop that I use. Using your hands, shape into spheres, or keep as is, if you prefer. Optionally, dot with 2 tablespoons chocolate chips. Adapted from my 5 Ingredient Chocolate Chip Cookie Dough Bites. You'll also love my 3 Ingredient Healthy Paleo Energy Balls and my Ultimate Fudgy Paleo Vegan Brownies (my fave). - Store for up to 1 week in an airtight container at room temperature. Bites are soft for up to 1 week! These look so delicious and healthy! I love cookie dough! Need to try these! Oh yes! They are seriously soo good! ???? Hope you enjoy Nathan! LOL I have totally been there on the cake Neli! ???? So happy to hear you’re enjoying the cookie dough recipes! Oh these dough bites look amazing. Definitely one good thing about being an adult – that you can eat cookie dough if you want to! Haha my thoughts exactly! ???? Thanks Kate! That was an interesting recipe. And they look yummy anyway. 🙂 Thanks for sharing. They look delicious. What would happen if I added some almond butter to the dough? Thanks Elana! Hmm… interesting question! Lol. I think you might be able to add a smaller amount, like 2 tablespoons or so. Fold it in last and see how it incorporates–see if you like the texture and moistness level. If it’s good, or you’d like more, add a tablespoon or so until you’re satisfied. It’ll make the cookie dough more moist. Good luck! Ummmazinggggg… hehe i already know this is gonna be good and I havent even made it yet. thanks!! Love!! Hehe! Thanks Chrissie! It is AMAZING!!! Enjoy. Hugs! Woohoo! ???? I can’t wait to hear how she enjoys them! Love this paleo version, it sounds so good! Oh you know it Kimberly! These sound great! I’m allergic to both almond and oat ( and several other things). Is there an almond substitute? These look so tasty! Such a delicious treat to satisfy a sweet tooth! Oh you’ve got that right Erin! These look like the perfect grab-and-go breakfast treat! They look incredible! Oh yes! They are great for on-the-go snacking! What a great sweet treat! I love that you can just pop them in your mouth! Haha yep! And it’s so hard to stop after just one! ???? I have all of the ingredients on hand! 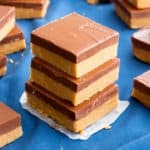 Making these bites asap! Yay! I think you’re really gonna love these Anna! ???? 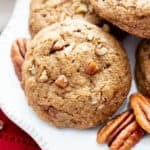 I have an almond allergy- suggestions on a flour that can replace almond flour in many of your recipes? Can you swap raw honey for or the maple syrup? I literally just ran out earlier today and I don’t feel like going to the grocery store at the moment. Any suggestions? Omg I just made these and substituted 1/4 cup PB fit peanut butter powder in place of 1/3 of the almond flour and they are AMAZING! !